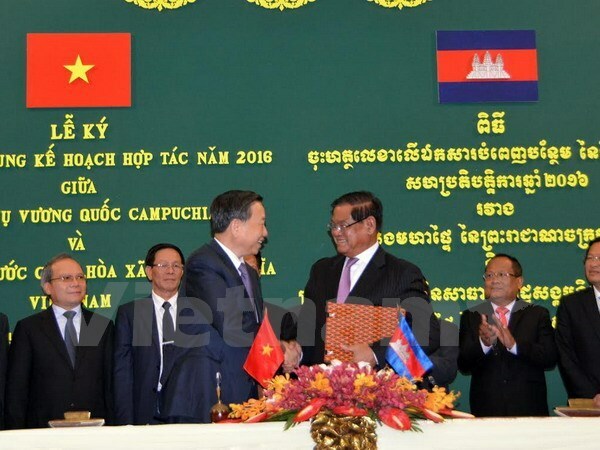 Phnom Penh (VNA) – Minister of Public Security To Lam and Cambodian Deputy Prime Minister and Minister of the Interior Sar Kheng have agreed to intensify information and experience sharing between the two countries in the fight against drugs and high technology-related criminals. At their talks in Phnom Penh on May 11, both sides appreciated close coordination between the two ministries and polices in combating crimes and ensuring security and order in each country. The police forces of the two countries collaborated effectively in preventing trans-national gangs and searching for wanted criminals as well as eliminating numerous rings of smuggling of drugs and counterfeit goods. Their coordination helps ensure security and safety for border delimitation and border marker planting activities and address complicated issues arising along the shared borderline. The two ministers reached a consensus on intensify the sharing of experience in managing and rehabilitating prisoners and in training officials for the Cambodian Interior Ministry. They then signed a supplementary document for the 2016 cooperation plan between the two ministries.